There is quite a bit of talk about politicians upholding manifesto pledges or sticking to their words etc. Strange how they only do it over certain things and not ALL of them. According to the MP code of conduct Members have a general duty to act in the interests of the nation as a whole; and a special duty to their constituents. If my MP votes for Brexit (which he did) and I end up worse off (likley) has he then not acted in my interest and broken the code of conduct? Germany says economic growth will fall by 1% if there’s a no deal brexit. Better get the WA re opened! A single 1%. Even with a WA the UK economy suffers more. That’s the end result of TM WA, tied to the EU with no voice. The situation is no less confused than it was a week ago; in a way, probably even moreso. The UK parliament has voted to say that it does not want a no-deal Brexit, yet the PM has now said that she does not want the backstop which the UK, itself, previously said it was willing to agree to and has been gone back to the EU, only to be told - in no uncertain terms - that there must be a backstop. Where does that leave us. To me, it comes down to a staring competition, which may well last to the end of March, with both sides waiting to see who blinks first. 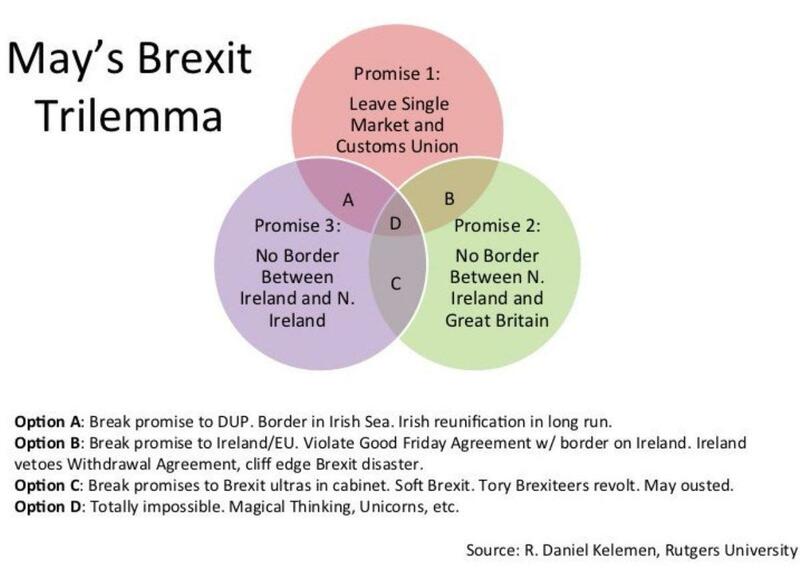 The DUP, of course, ignores the fact that the majority of the NI population voted to remain, but that's really only secondary to them, as indeed are the economic interests of NI. It's unionism and damn the consequences. There is, I think, another aspect to this, which has not really been commented on widely - an elephant in the room - which should perhaps be addressed. Quite apart from the fact that the Tory govt is supported by the DUP, there is a considerably body of opinion in the Tory party which is strongly anti-Irish and views Ireland in a rather condescending, supercilious manner. So, it's one thing to view to be forced into a course of action by the EU (for that, in many Brexiteers' minds, read "the Germans"), it's quite another to have that done by Ireland or the Irish. Obviously, they won't say this publicly, but I think that there is an aspect to the Brexiteers' psychology which is perhaps being overlooked and for Britain to be forced into agreeing to a backstop, it would effectively be perceived as Britain being forced by the EU to surrender to the Irish. Of course, the Tory party is also the "Conservative and Unionist" party, so that is another factor, but there would be a considerable body of opinion within the Tory party which would find it difficult to accept a solution which involved a concession to Ireland, particularly where it involved the sovereignty of NI. And here again, they are seeing NI as simply a territory, without any consideration of the interests of its population. It's a right mess, but I wonder if the EU is fully aware of the psychology here; perhaps it may take the view that "we don't care" or "not our problem". And it also has to be said that we're at the stage where a reasonable outcome, which protects the interests of NI and its population might well bring down the UK Government. It's hard to imagine a mutually agreeable solution at this stage. Yes I have seen that article before, as I said before Cameron didn’t do his due diligence and paid the price. For Kenneth Rogoff, the former chief economist at the International Monetary Fund, the issue is less the idea of the vote than the low bar officials established for Britain to secede from a union it’s been part of since 1973. Brexit required merely a simple majority of “leave” votes among the fraction of eligible voters who turned out at the polls. [Yes I have seen that article before, as I said before Cameron didn’t do his due diligence and paid the price. No, the UK is going to pay the price (and already does) for Brexit-vote. It's a right mess, but I wonder if the EU is fully aware of the psychology here; perhaps it may take the view that "we don't care" or "not our problem". I think it's mostly: "Well, that's tough for you. Now get over it." And it also has to be said that we're at the stage where a reasonable outcome, which protects the interests of NI and its population might well bring down the UK Government. It's hard to imagine a mutually agreeable solution at this stage. No, it isn't. There is exactly one such solution and it's negotiated and completed. The UK is free to ratify it or to shoot its own brains out with a no deal Brexit. I'm really tired of the UK jerking us around for their own amusement and childish nonsense. It's time to grow up and to join the adults. Well I’m expecting them to revoke Article 50 a week or so before the end date, Parliment has shown its hand at the poker table. It's a game of chess, however, so we keep wondering what Theresa May is doing with those cards. Sad, it means we still have to deal with those Brexiteers. Well the EU have to protect the interests of their member state Ireland. They won’t be doing that very well if there’s a hard, no deal brexit. Parliament has already prepared the ground for rejecting a no-deal Brexit. Given the EU show no sign of shifting from their position (why should they?) and that Parliament has already rejected the negotiated deal, in two weeks’ time, the Government will most likely be faced with a stark choice - request an extension of Article 50 (I’m struggling to see why the EU would agree to that) or revoke Article 50. All other options will have been rejected by Parliament. That’s taking back control and Parliamentary sovereignty in action. Isn’t that what Brexiteers wanted? The wish of the people needs to be respected and if the EU only allows the hard Brexit, so be it. It would kill democracy if it comes to the great betrayal. That would be an unsatisfied outcome for everyone. That would probably also not work, as many MPs demand "not one penny for the EU" and revoking means paying your membership fees again. Imho the UK will simply drop out in a Hard Brexit. There simply is no deal that would make it in the British parliament. And with the leaders of both major parties being totally unwilling or unable to speak honestly about the options and preferring to promise more fairies and unicorns, I do not have hope that there will be a solution, other than the UK more or less dropping out in a hard Brexit by accident or incompetence. Theresa May seems to be using this "negotiation period" for purposes other than negotiation. 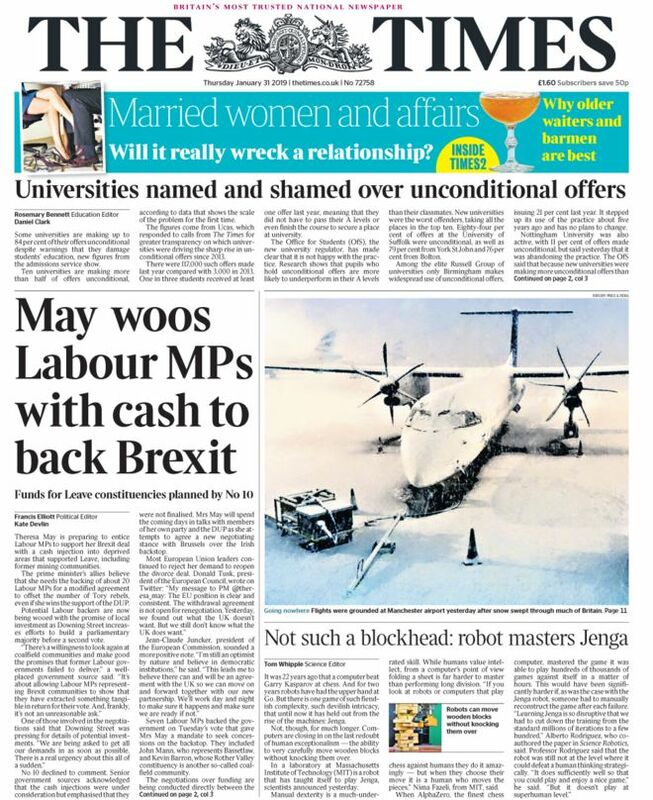 Reported in various papers this morning, she is attempting to offer cash to (bribe) around 20 Labour MP's to back her Withdrawal Agreement. Anyone who can now describe the UK as a pillar of democracy is deluded. With Option C, it's worth bearing in mind that May is immune from being removed by her own party until December, so she will only go if she loses a vote of no confidence in Parliament (happened recently as a stunt by Labour that failed and Sir Vince Cable has indicated the Lib Dems won't back another VNC for the foreseeable) or if she resigns. Well its funny you say that, I know a couple who were married for 20 years and fought like cats and dogs during their marriage . Short story they divorced and to my surprise get on better now than anytime when they were married, go figure. to stay in that analogy, FWB status is illegal. They probably didn't drag the whole divorce thing by making contradicting demands, then. I actually wasn't trying to make an analogy, just a quip about a divorced couple nothing more nothing less. What good would extending A50 be? You’re just going to be kicking the can down the road. By the way that amendement in Parliament rejecting a no deal brexit...wasn’t legally binding, just like the EU referendum of 2016 don’t forget!! And as the Hard Brexit is the default outcome, it can never be ruled out, otherwise the EU could force the UK to accept any deal. The hard Brexit always was and always will be the cleanest option. It's known that there is not enough parliamentary time to get through the necessary legislation assuming the WA passes, let alone should it not. It is pretty much a given that A50 will need to be extended, it is just not politically possible for TM to admit this currently. You will note in recent speeches she has stopped forever mentioning March 29th.... there is a reason for that. You probably agree with me Richard. Extending A50 is just kicking the can down the road. It would be pointless, only to end up in the same position in a few months time. Unless something gives, from the EU or the UK. Considering the news this morning of Italy in recession and German economic growth slowing, it will be interesting to see if the EU27 governments put pressure on the EU to open up the WA again. A hard brexit isn’t going to help anyones economy. Well the good thing is that the UK is still doing well, why the EU is deep into a recession. So maybe it is really better to get out for the UK, so the UK does not have to pay for the failures of Italy, France or Germany. Not for me. It's what I want to happen. The only way which an extension of Article 50 would be viable is if a deal is close and more time is needed to thrash out the details, otherwise it's as you say, kicking the can down the road (something this government seems to be good at in other areas). The EU probably won't care whether it's in our statute book or not after 29th March 2019. Otherwise, everyone is remaining silent. I see nobody else joined the Polish minister who broke ranks the other week claiming Ireland needs to offer concessions. The hard Brexit always was and always will be the cleanest option. I shouldn't argue with trolls, but a hard Brexit is the worst option of them all, period. I'm still of the belief that when it comes to crunch time May is more likely to cancel Brexit (providing Parliament backs it or through a second referendum) than go for a hard, no-deal Brexit. The Brexiteers won't like it and some of the contingency measures since taken by firms to move (easyJet reregistered 100+ aircraft in Austria, RR moving certification to Germany, banks moving assets/people to the likes of Dublin and Frankfurt) aren't going to be reversed quickly (if at all), but at some point May will have to decide what is better for the country given what we know now and if all options have been exhausted. ROTFL, that's one of your better ones so far, seahawk. It is the most painful, but not the worst, as both sides can plan the future freely afterwards and can offer planing security. Compare it to the UK revoking Article 50 and a sizeable group in parliament (and UKIP) devoting themselves to deliver Brexit after the next election. Nobody can make any long term plans. Or the UK signing a deal that they did not want to sign. Next election will then bring promises to re-negotiate, get a better deal or do the hard Brexit. there are good reasons why Norway rejected the idea of the UK joining EFTA, because EFTA is stable, which it would not be with the UK in it. Sure deal supported by a clear majority in the UK would be better, but there is no such deal. Life will go on. Recessions come and go. Providing i’m alive, able and well, i’ll be getting up for work as normal on March 30th. I can 100% guarantee that I will not be getting up for work on the 30th March like I did on the 29th March...... it's a Saturday. I agree with your analysis on the UK being caught in a state of permanent renegotiation after Brexit, but I feel this is going to be the outcome regardless, including no deal. It's a given that any outcome is going to be unacceptable to enough people to seek immediate changes to it: labour will bring the CU membership back up the day they come to power, remainers will keep pushing for a Norway style status, Brexiteers will always find a link between the EU and the UK that they will like to cut (anybody told them yet the ECHR is NOT the ECJ and the UK will be subject to its rulings still, for instance? ), and don't forget that in any case an all important FTA needs to be agreed to as well still, so rather than end the discussion on Europe with Brexit, the UK's relationship will most certainly dominate British politics for the rest of next decade. All because all to many British politicians suffer from a national identity crisis, not being comfortable with the (deminished) status of their once very great country in today's world, combined with an empoverished population dreaming of those good old days, not because they care about the status of their country like their Conservative and millionaire leaders do, but because of the better living standards they had back then (which deteriorated due to those same Britsh politicians previously failed attempts of making the UK great again via a social race to the bottom). I can 100% guarantee that I will not be getting up for work on the 30th March like I did on daysaturdayafter, so is athebrilliant 29th March...... it's a Saturday. The micromanagement of TM in selecting the date for Brexit was brilliant: Brexit should happen in a weekend. But after a hard Brexit it is mainly a British problem again. The EU is able to plan stable budgets, move forward with modernisation or deeper integration. Industries can move their assets and plan their manufacturing process based on the new situation. A hard Brexit will create a bump in econimc development in Europe, but it will be just a bump. A never ending Brexit will have the same practical effects, just with even more uncertainty. That vote was a ‘placeholder’ with a specific purpose. It enables a binding vote on a no-deal Brexit when next debated in less than two weeks. That’s when the brown smelly stuff finally(?) hits the fan. Well Richard you’ve well and truly caught me out there...we will go with April 1st then. we will go with April 1st then. There was a rush for Britons living here in Denmark to get Danish or dual Danish/UK citizenship. But that was back in 2017. Easy? You live and work here. You have paid your taxes. You pass a multiple choise test showing basic knowledge of the country, 30 correct out of 40. You prove to be able to communicate without much trouble in Danish language. You have a criminally clean nose, a hefty speeding ticket sets you back a couple of years. The rush started late June 2016 and is long time over.